Nestled in the redwood forests, yet minutes from the beach, lies a thriving community that enjoys a booming high tech industry,excellent schools, and lovely residential neighborhoods. It is a juxtaposition of these and many other qualities that make Scotts Valley a unique place to live and work. Scotts Valley is unrivaled in its ability to balance industry and community, education and experience, and improvement and beauty. Perhaps it’s the dichotomy of vastly changing landscapes and diverging views, or maybe it’s the way local businesses support and foster a lucrative yet tranquil way of life. Whatever the reason, it is clear that Scotts Valley provides an optimal environment for it’s residents to thrive in their work and in their lives. Climate: Scotts Valley’s climate is characteristic of mountainous coastal terrain. Summer is mild with occasional cool, foggy mornings and an average daily temperature ranging in the 60’s to 80’s. Autumn is typically warm with little rainfall. Winter brings necessary rain but is otherwise relatively mild with temperatures ranging from the 30s to 60s. Spring means gradually warming temperatures with occasional moderate rainfall. Annual average temperature is 68 degrees, and average annual rainfall is 41.18 inches. Location: Scotts Valley is situated in northern Santa Cruz County, just a short distance from Monterey Bay and nestled in the redwoods of the upland slope of the Santa Cruz Mountains. It is approximately six miles north of Santa Cruz, 30 miles southwest of San Jose, and 68 miles south of San Francisco. 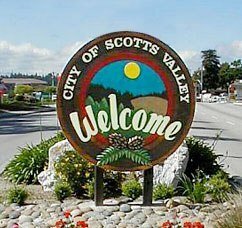 Naming: Scotts Valley is named after Hiram Scott, who settled in Santa Cruz and purchased Rancho San Augustin in 1852. The city is located on a part of his family’s old ranch site. Check out Metro Online, a service of the Santa Cruz Metropolitan Transit District, the mass transit system for the Santa Cruz County in California. Commuting from Santa Cruz / Scotts Valley to Palo Alto / Menlo Park? Please consider our vanpool that embarks from Pasatiempo Drive – Hwy 17 at 5:50 am and picks up at Granite Creek – Scotts Valley Drive at 5:55 am. We currently drop off at PARC, Roche, and HP in Palo Alto; at Stanford University; and at the USGS and VA in Menlo Park. We return to Scotts Valley at 5:00 pm and to Santa Cruz at 5:05 pm. The van has individually reclining, high-back bucket seats for 14. Almost all of the passengers snooze during the trip. For more information, call Gil Ramirez, (650) 493-5000 x22918, Carolyn Degnan, (650) 329-5052, or Regina Roberts, (650) 724-0848.